The original name was the B & B Cut Rate Drug, because they sold below the recommended manufacturer price put on their products. Mike #2, Reinhold's son, went to work for my B&B right out of college in 1965, They were the only store to have 3 locations in Downtown Minot and move twice. The first location was on the northeast corner of 1st Avenue and 1st Street Southwest, now a parking lot. 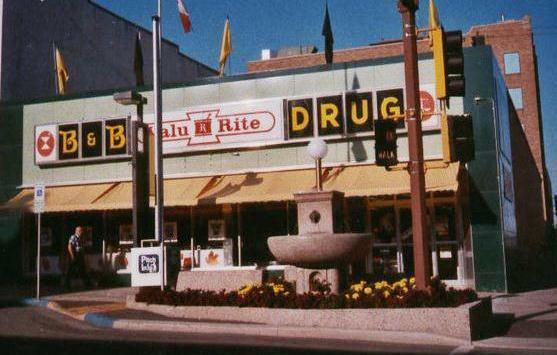 They moved to the in 1971 at 108 South Main, just south of Jay’s Men’s Store. This location was a larger store so they added more cosmetics, toys and expanded other departments. The third and final location was on the south west corner of Main Street and 1st Avenue, at 100 South Main. The building at 1st and 1st was just across the street from Dad's business...The Ward County Independent. B&B was my second home when I went to work with Dad. #1 was Harry's Tire Service. Being 5 years old I was very brave and tended to wander. Dad always knew where to look for me. Bill (my Dad) and Mike #1 were very good friends. We did all our business at B&B. The Berg's also owned a cabin just up the road from us on Westegard Addition at Lake Metigoshe. Mike #2s sister, Marion, babysat for me on evenings when the "old folks" got together to play bridge. Mike #2 and I were both dedicated members of the Minot Rotary Club for years. We followed the tradition of our fathers' and grandfathers'. 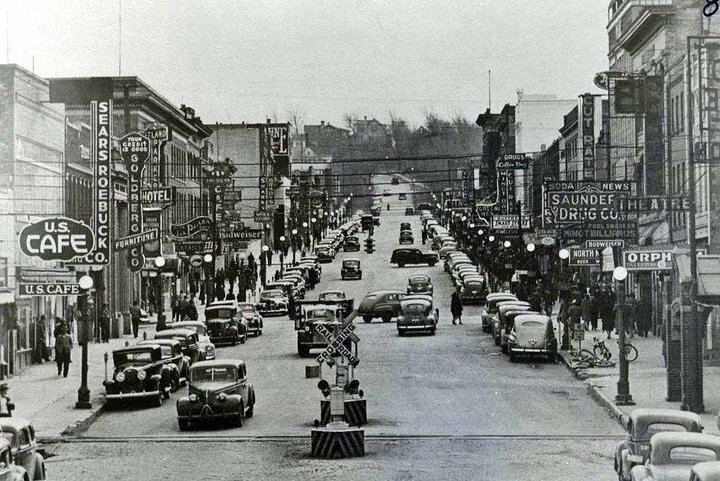 Minot was a fabulous place to grow up and for me to raise my family!